Warning: While I take great care to avoid spoilers, this review may contain phrasing that may impact the reveal of certain events within the story for the sake of expressing a point within the argument/opinion below. 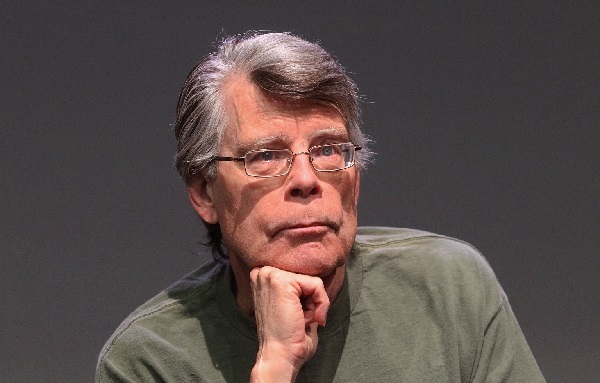 Stephen King, the great horror and suspense mastermind, has been terrifying readers for years through his many literary creations since 1974’s Carrie. Among his most recent works include Doctor Sleep (a sequel to his landmark tale The Shining), Under the Dome (which was picked up as a television series that, at the time of writing this, is currently in development with its second season), and the current three book series known as The Bill Hodges Trilogy. After the first entry into that latter example stood Revival, an overlooked novel about faith and fear of the unknown. But is this work of fiction one that shouldn’t be so quickly dismissed, or is it proof the legend is running out of ideas? Before the book even begins, we are greeted with a message thanking some of Stephen King’s inspirations. One of the most notable being H.P. Lovecraft, who seems to be the basis for King’s writing style this time around. Like many of Mr. Lovecraft’s works, this one is told in a first person reflection, as if writing the facts down for all to know the madness the writer had witnessed for the sake of trying to reclaim some sanity, or at the very least put the events into perspective whilest hoping to prevent others from falling to similar follies. However, unlike in the original lore where most of the monsters or elder ones were indescribable, this tale tries to put some kind of face on them with a clear recollection of events throughout the tale. In a way it works to help pull the reader in and start to care for certain characters and the outcomes they face, while it also causes a good amount of padding as well. Revival is the tale of Jamie Morton. His small Maine home town needed a new priest, which is where Pastor Charles Jacobs, a man fixated on the power of electricity, comes into the equation. After a chance meeting involving Jamie as he played outside with toy soldiers his sister got him for his birthday, it seemed the two, as well as the Morton family as a whole, were to be somehow connected with one another. After plenty of energetic speeches, not to mention curing Jamie’s older brother, Con, after a skiing accident rid him of his voice, the family befriends Charles’ wife and son, who they call Tag-Along Morrie. Of course, tragedy strikes, leading “the terrible sermon” and the pastor’s expulsion from his priestly duties. As the tale unfolds, Jamie dictates his life and how he became interested in the guitar. As if instinct, he was able to figure out the chords, and eventually was offered a spot with a local band by the name of Chrome Roses, thus allowing him to pick up his highschool crush, Astrid, a key player through many firsts in his life, and the later obstacles he is forced to face head on. Much of this is outlined through the many gleeful years, such as his first cigarette and how Astrid would puff smoke into his mouth before kissing him, his descent into drugs, the gruesome deaths that befell his immediate family, and other hardships that come from and and life in general. Many of these lead Jamie to a chance encounter with the pastor once more, saving his life through another experimental cure. It also opens the door to an eventual discovery of what Charles has been doing since leaving the town, essentially becoming a televangelist who heals people at tent revivals among other jobs. The problem is that these cures come with side effects that hit afterwards, either immediately or later down the road. Some severe, some not so bad, but Jamie, as one who had experiences such things first hand, has made it a mission to expose and try to stop the former pastor. Instead, he is pulled into the man’s dark experiments kicking and screaming, forced into the position of later accompanying the now mad scientist on his experimentations and research that takes on a nightmarish world with traces of ancient beings and visions of ant-like beings and other worlds. While Revival is written quite well, it’s literally after the fourth chapter that you can’t help but feel a good amount of information being divulged really could have been reduced. Much of it wound up being padding to the core concepts of how his later employer had met Charles Jacobs, his after effects, the research and intimacy during his time employed as a session musician and producer, and the obvious growth of obsession in the former pastor through chance encounters. If not for the nagging curiosity of wanting to know what these side effects, such as “prismatics” mentioned to him at a tent revival by his then current boss as the recording studio/ranch, and how certain hallucinations like Jamie seeing dead family members and warnings that “something happened”, this probably would have taken much longer to read. For a good six more parts, the progress seemed agonizing, reducing the roughly thirty-five to forty pages a day I averaged to that of maybe ten every other due to how painful it became to sit through. It was like nothing was really happening other than wonderous nostalgia on the character’s part, divulging only little bits from time to time to intrigue into the next segment of the chapter. Another issue to be had is the plethora of jumps in time, which often plays a factor in the rough progression of the story towards modern day. One thing the book could have used were some indications on when we go from present day to the past in the middle of a large part of story. At times it’s fairly obvious, such as the final chapter in which Jamie jumps between his brother Con in the present and follow-up information of events during the last two chapters that went untold. There were, however, a couple times following the fourth chapter that my perception of time was just lost and unclear, even after completing the book or re-reading segments again to get a better grasp on when and where I was in the tale’s chronology. Half the time I Had no idea if we were talking within the 2000’s, or still sometime in the seventies or eighties, maybe even nineties. The only way to know is the occasional pop-culture reference for the time period. Sadly, even those wound up fairly scarce, but exciting to come across, allowing a moment of clarity to better understand where you stood within the story. 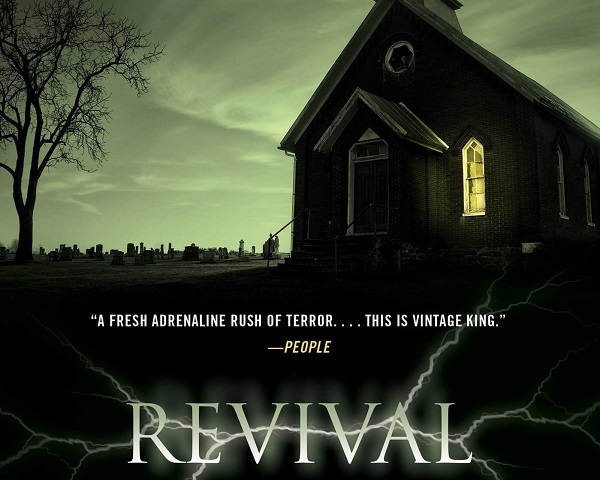 There exists a paperback version of Revival, which was released in early May of 2015, and there doesn’t seem to be any major difference between the two (based on what I’ve read). The hardcover weighs in at 405 pages, while the story in the soft cover edition reaches 403. Unlike other editions of later re-pressings from Stephen King that later go to paperback, such as Full Dark, No Stars, this one doesn’t come with a bonus story or teaser for the next novel due out soon. All that’s really different is the artwork, which is a vast improvement over that dust jacket that adorns the original version. Instead of a depiction of lightning with varying hues, this one plays up the book’s title by having a green sky silhouette a church and its surroundings with the title of the book emitting small electrical charges around it. The two are literally worlds apart, and was enough to trick me into giving this a second look. The cover to the 2014 edition did nothing to make me, a fan of Mr. King’s work for quite a while, show any interest in it at all, let alone make me want peruse the summary. This one, however, did a much better job at grabbing my attention, plus it’s just aesthetically pleasing to the whole point of the story. But, truth be told, Revival is not that bad a novel. While heavy on the likes of Frankenstein by Mary Shelley, this is clearly a love letter to H.P. Lovecraft, as well as his works, most notably his short story titled The Silver Key. Stephen King also goes so far as to cite him during some of the research Jamie and Bree do on Charles over the years in reference to certain books forbidden by the Roman Catholic Church they believe the former pastor may have come into contact with. What’s more is the reference to other realms, even alluding to the existence of the ancient gods in this universe as well, not to mention the creatures that serve them, which actually does make you start to consider that perhaps Mr. King is kind of running out of ideas for scary monsters when we’re supposed to be afraid of things that can be summed up as human-like ants. However you look at it, if you’re willing to put the time and patience into this book, especially during the sandpaper-like padding of whar makes up a good chunk of its literary center, you’ll find an engaging, even emotional tale that screams one season television series, all with a climax that may be short, but does play on everything vital the tales progression and character development you read up to that moment plays off, making the moderately worth it. This review is based on a first pressing of the 2015 Paperback version.